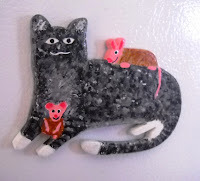 Laughing Fridge Art Magnets: Featured in an Etsy Treasury! Great!!! Congratulation!! It is a good opportunity for exposure. Hey i'm writing the interview. I think tomorrow I have it done. Sorry if i did not contact you before, but my little boy is making a tooth and i had two really difficult days ( no sleep, no eat, no happy). I took exactly the questions of the interview in etsy front page. If you have yours already done, send it to me so i can already publish it. Congrats on the treasury! Your magnets are wonderful!